The Fallas is the biggest annual Valencian celebration. It is a world famous street party, a spectacular celebration of Valencian tradition for the locals and an enormous cosmopolitan festival for the visitors. 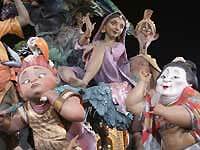 During the year, over 350 Valencian communities (also called "fallas") construct huge colourful fallas-sculptures (2 each = around 800 in total) made of wood and papier-mache. The fallas are usually satirical in content and often elaborate works of art, some as high as 25 metres. On the 15th of March the fallas get planted throughout the city and Valencia explodes with the party. Millions of petards are set to explode, there are state-of-the-art fireworks twice a day and a buzzing nightlife complete with mobile discos and concerts. For the next four days the entire city takes to the streets to walk around and enjoy the fallas-sculptures. The fallas-communities themselves break out nomadic camps on the streets and cook paella on the pavement. On every street you walk, there is a parade of the locals in traditional costumes and with music bands. Every evening there is a colourful carnival in the central square of the city, with a different theme every night. On 16th it is the folkloric carnival. On 17th and 18th it is the Offer of the Flowers – a wooden silhouette of the Virgin in the plaza de la Virgin is filled in with carnations, brought by traditional parades in full colours and music. On 19th it is the Carnival of Fire. The whole city walks the streets by day and by night Valencia turns into a mega street party with concerts and discos on every square, accompanied by an all-out war of petards and fireworks. 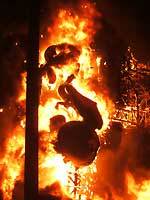 Finally, on the night of 19th of March, all the Fallas-Sculptures get simultaneously burned to the cheers of the crowd. Thus is commemorated the coming of spring.